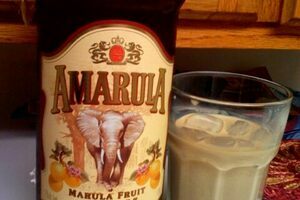 Rich and silky on the tongue, Amarula cream is a South African liqueur that blends fermented and distilled marula fruit with cream and sugar to make a sweet, butterscotch-flavored drink. The marula fruit, a yellow bulb housing tart, white pulp, is also popular among South Africa's wildlife. Its nickname, "the elephant tree," comes from the pachyderms' preference for its flavor. To make the luxurious liqueur, people gather fallen marula fruits between December and March when their sugars are prime for fermentation. After the fruits are washed and processed, natural and added yeast ferment the pulp to around 10 to 13 percent alcohol. At this point, the fruit wine is ready for two rounds of distillation. Oak barrels then house the boozy brew for at least two years, deepening its nutty and lightly spiced flavor. But Amarula cream liqueur is truly born when makers blend in whole cream and sugar, creating its signature silky base. Poured over ice, Amarula tastes like a boozy butterscotch sundae, a characteristic that has made it an ideal alternative ingredient in piña coladas, Brandy Alexanders, and, of course, spiked coffee. The booze, which clocks in at 17 percent alcohol, also adds a little buzz to chocolates, fudge, and decadent Amarula-filled brigadeiros.